Stomp Rocket Ultra Review (2018)- Is this the Best Stomp Rocket ? Obviously the Ultra Stomp Rocket is ideally played with outside. When you are going for height, those 8 foot ceilings just seem to get in the way. However, on rainy days we have had a great indoor foam rocket battles. The rockets are light weight foam, so you can play indoors and not worry about breaking things. But like I said, I think outdoors is best because you can spend hours adjusting and fine tuning your blasts to try and get the rocket at just the right height you are looking for. 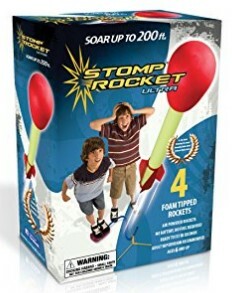 Kids actually get very creative with the Ultra Stomp Rocket, figuring out different targets to hit and exactly how hard they need to stomp to hit the target. Another thing I like about this toy is that it travels easily. Going to Grandma’s house for the day? Bring the Ultra Stomp Rocket! It’s perfect. No loud noises that will bother grandma and the kids will have fun for hours playing outside. Some of the best features of the Ultra Stomp Rocket are that there is nothing to assemble and it needs no batteries. This is just a simple, fun toy. The Ultra Stomp Rocket will provide instant shock and awe from the first time you use it. I’m putting this into the 5 to 7 year old category, although I think Amazon puts this toy in the 8 and up category. In my opinion, I think kids as young as 5 can start getting the hang of launching the rocket and having a great time. Whether you are 5 or 35, this toy is just plain fun.